Join our Loyalty Program next time you visit! It’s free and easy to sign up! -Rewards are earned on purchases of plant material including trees, shrubs, perennials, roses, annuals, herbs, houseplants, fall mums, and holiday plants. -You will earn 3% on qualified purchases. For each dollar spent, you will earn 1 point. Once 250 points have been earned, a 3% cash reward will be generated to be used towards future purchases of qualified plant material. -A minimum of 250 points must be earned before redeeming. -Points can be used towards the purchase of plant material only. -Gift certificates, labor, mulch, loam, delivery fees, seeds, bulbs, and hard goods are excluded. -Points cannot be redeemed for cash and cannot be transferred. -Points will be adjusted for returned items. -You must present your loyalty card before sale is completed. Points cannot be added after a sale has been completed and points cannot be added retroactively. 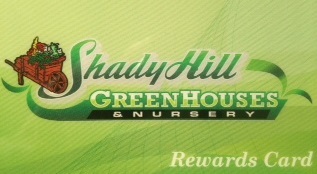 -Shady Hill has the right to make future updates or modifications to the rewards program.